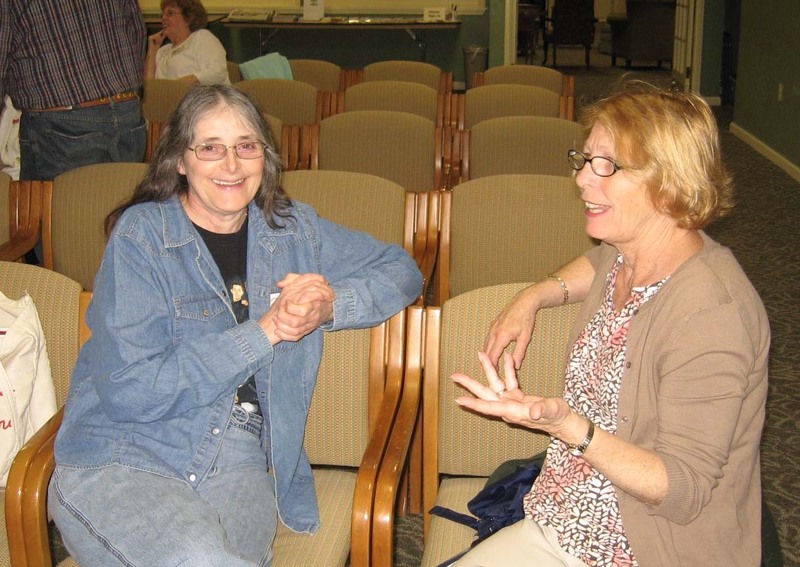 Members and guests of the Genealogical Society of Salem County enjoy the many meetings and workshops that the Society offers. 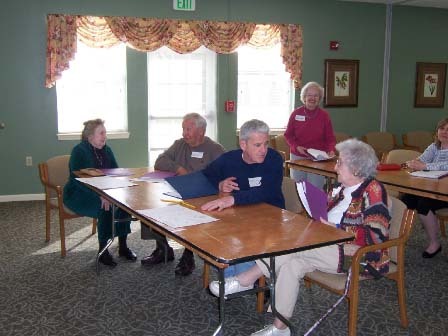 Meetings include guest speakers presenting on local history, professional genealogists explaining various resources, and members sharing helpful hints for researching. 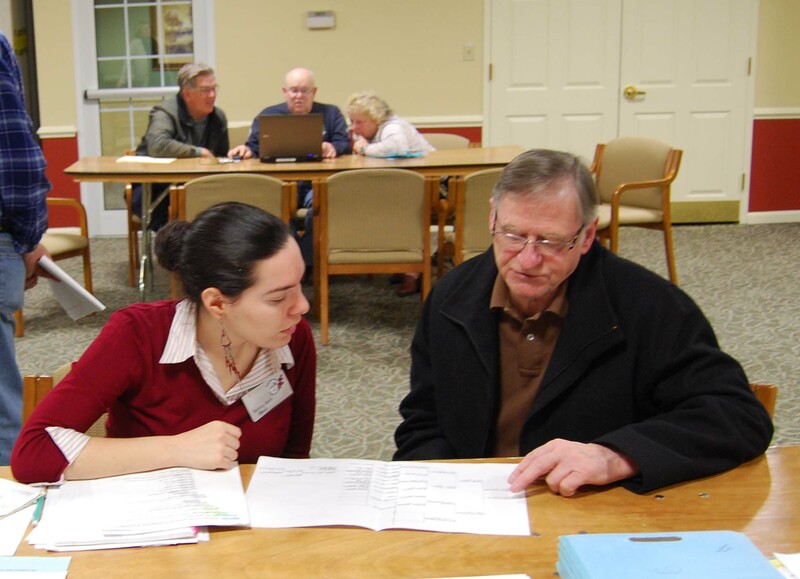 Our special workshops help newcomers learn the basics of genealogical research, as well as allowing members to network with each other and compare family trees. 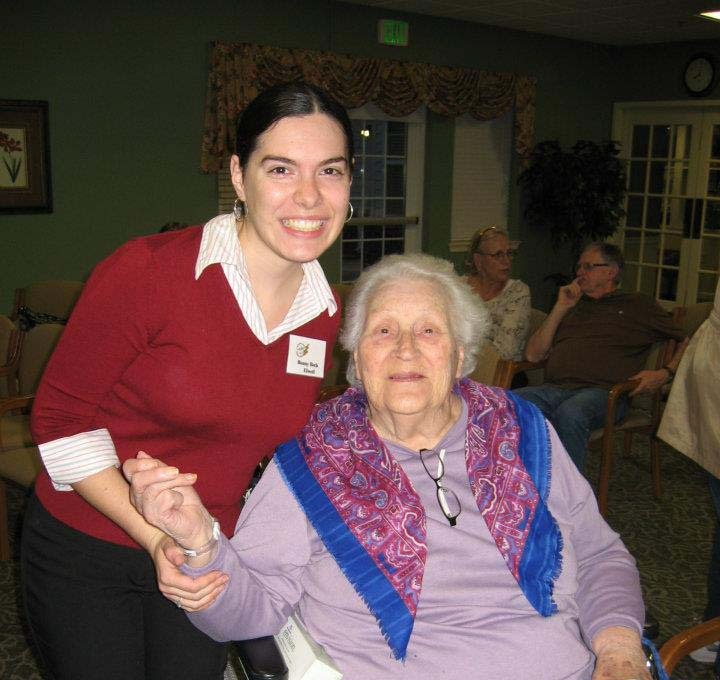 Below are some photographs taken during several events over the past few years. 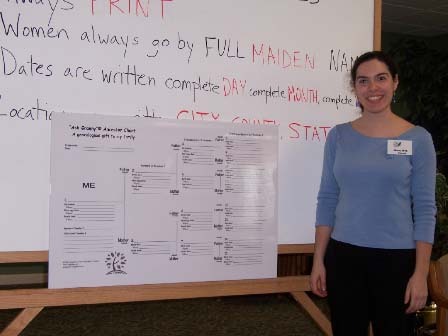 Representatives of the Genealogical Society often display booths at local community and historical events to reach out to people who may be interested in family history research. One of the Society's primary community outreach opportunities is an annual booth at the Salem County Fair. To see photographs of our booths at the fair, visit our Salem County Fair page. Traveling back to the home of their ancestors, nine members and guests of the Genealogical Society of Salem County took a trip to historic New Paltz, New York, which was first settled by French Huguenot and Dutch Reformed settlers in the mid-1600s. 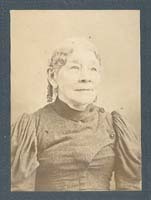 Some of the original founders of the town included the DuBois, Nieukirk, and Van Meter families, whose descendants later moved to Upper Pittsgrove in Salem County, New Jersey in the early 1700s. 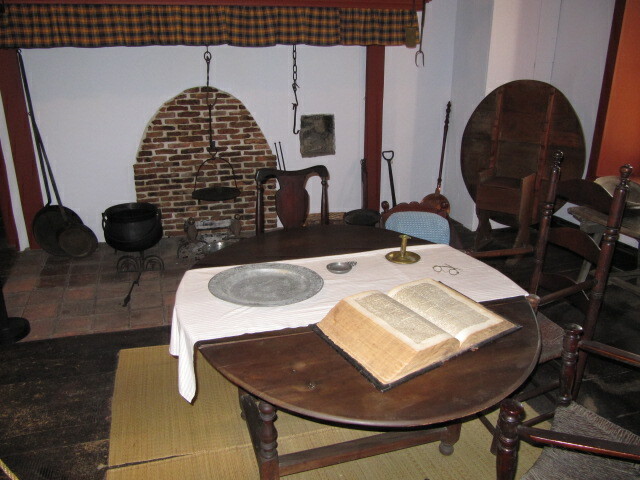 The Genealogical Society was able to peruse the archives of the Historic Huguenot Street museum. 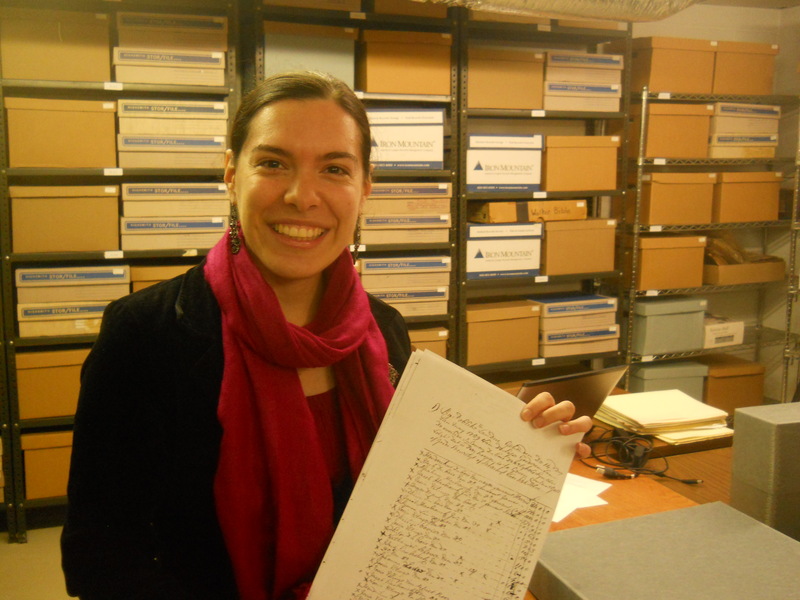 Here, President Bonny Beth Elwell displays a copy of the will of her ancestor Solomon DuBois. 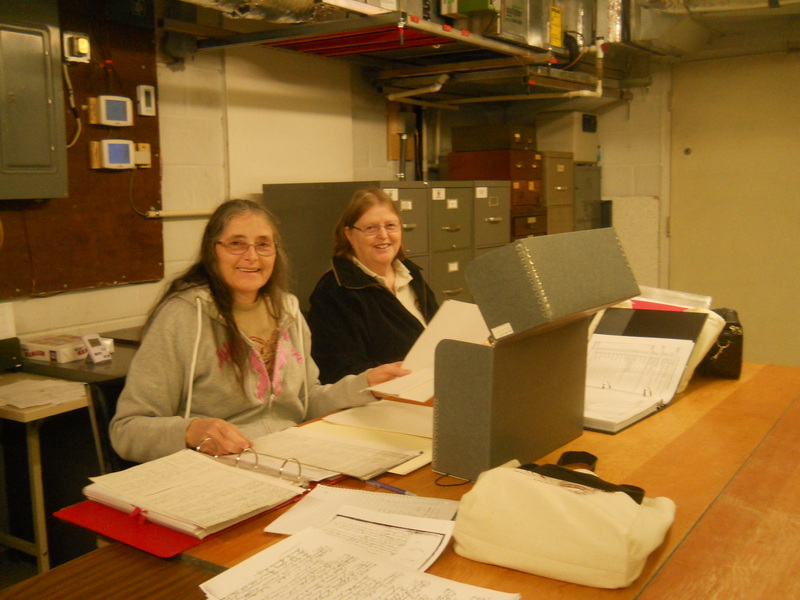 Two members of the Genealogical Society search the archives of Historic Huguenot Street for genealogical information on their DuBois, Newkirk, and Van Meter ancestors. Members of the Genealogical Society had a chance to explore the old cemetery and tour this replica of the original French Huguenot Church. The Genealogical Society enjoyed a tour of Historic Huguenot Street, including several early 1700s stone houses. President Bonny Beth Elwell poses with a basket that is said to have been brought to America by her ancestor who was one of the original immigrants in the 1600s. An old DuBois family Bible is displayed at the historic J. Hasbrouck House in New Paltz. The nearby DuBois Fort was built by Daniel DuBois, a relative of the DuBoises who moved to New Jersey. 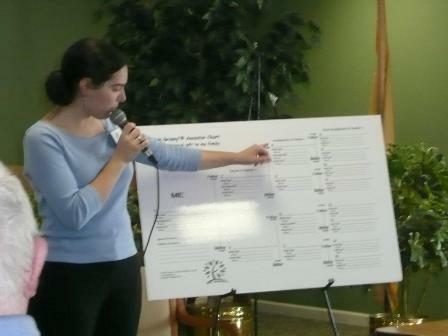 President Bonny Beth Elwell compares family trees with a fellow member at a genealogy workshop. 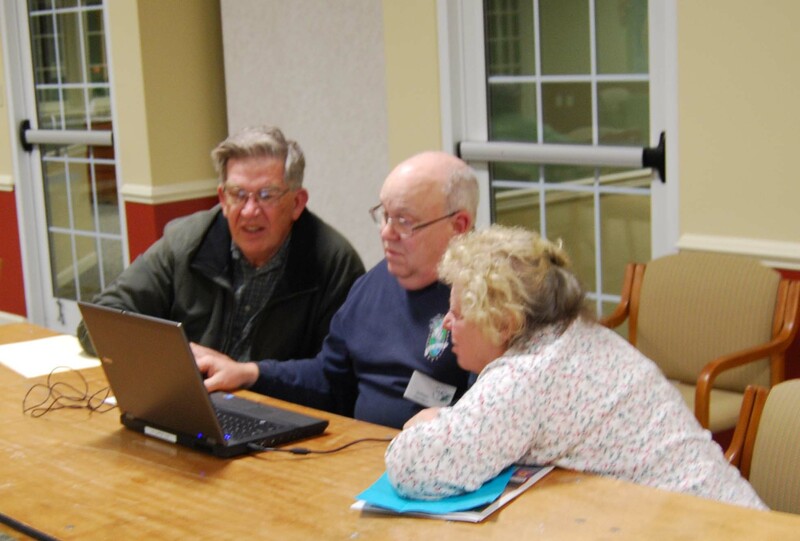 Genealogical Society members search for ancestors using internet sources such as Family Search and Ancestry. 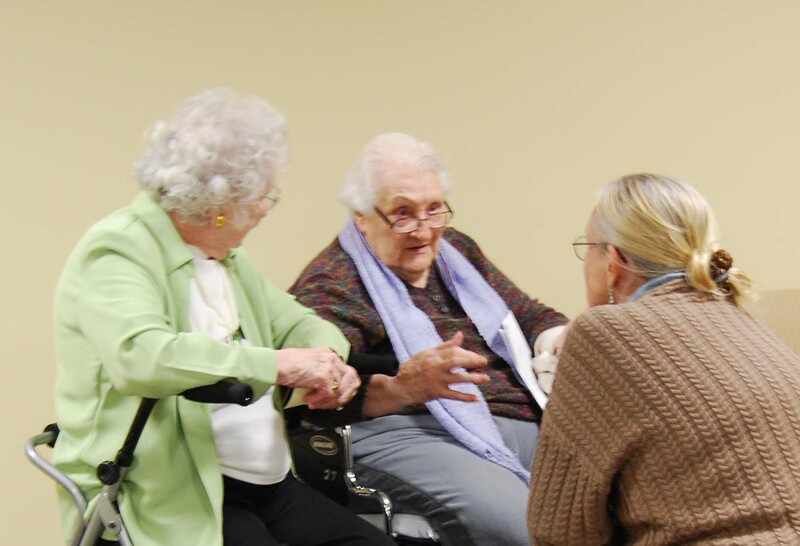 Past President Ruth Hall Brooks (center) shares some of her extensive knowledge of Salem County history and genealogy. 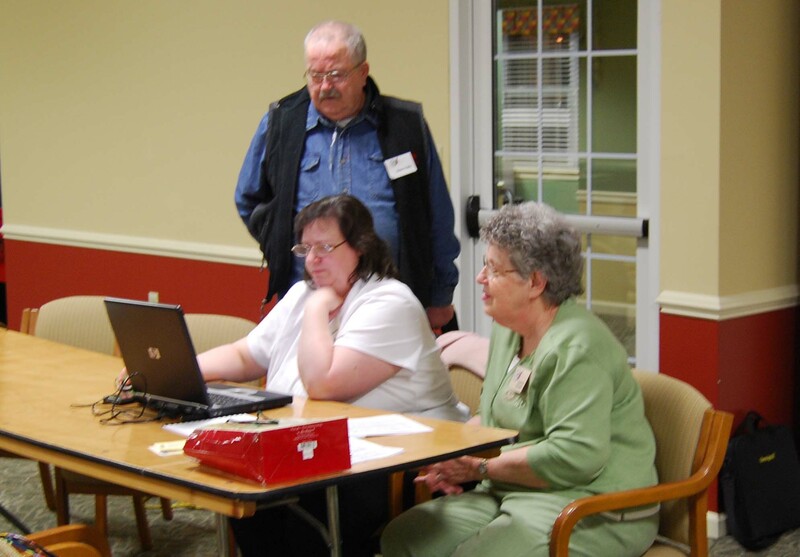 Members assist each other with learning new ways of searching for ancestors through the internet. 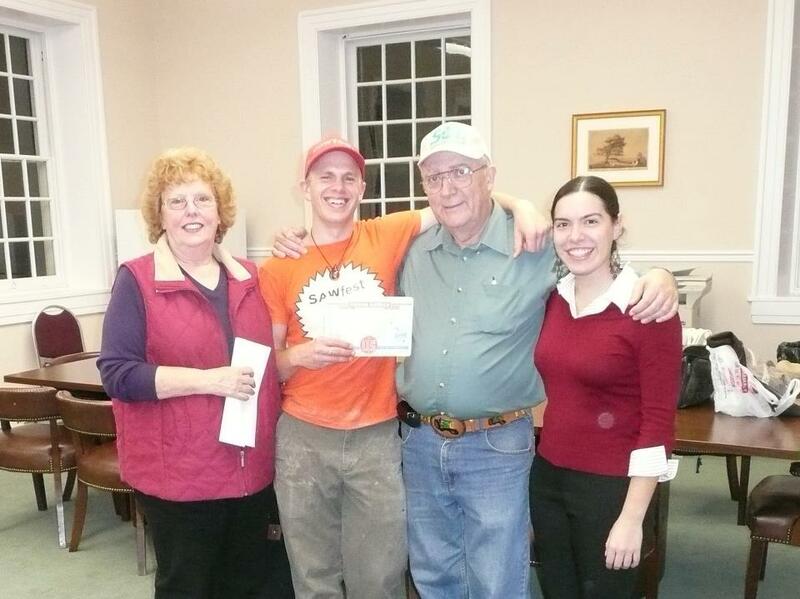 At the monthly meeting of the Genealogical Society of Salem County, Anthony Melita of Revolution Tours, Inc. spoke on the Battle of Quinton's Bridge. He also demonstrated Revolutionary weapons and gear. Over forty people attended the fascinating presentation. Members enjoy chatting after the meeting. 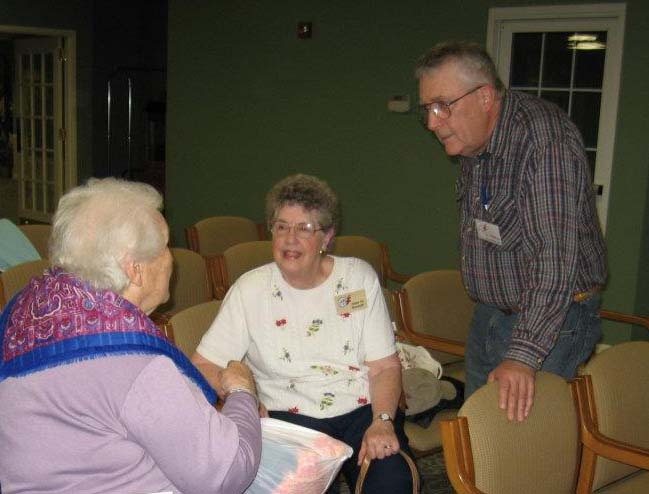 Past President Bill Stoms and Newsletter Editor Anne Rossell chat with Past President Ruth Hall Brooks. Current President Bonny Beth Elwell poses with Past President Ruth Hall Brooks. (l to r) Emma Scholes, Emile B. Klein, Bill Stoms, and Bonny Beth Elwell at the Old Salem County Courthouse, where Emma assisted Emile in recording local oral histories for his You're US project as he bikes around America painting portraits of today's American people. President Bonny Beth Elwell explains how to fill out a pedigree chart. 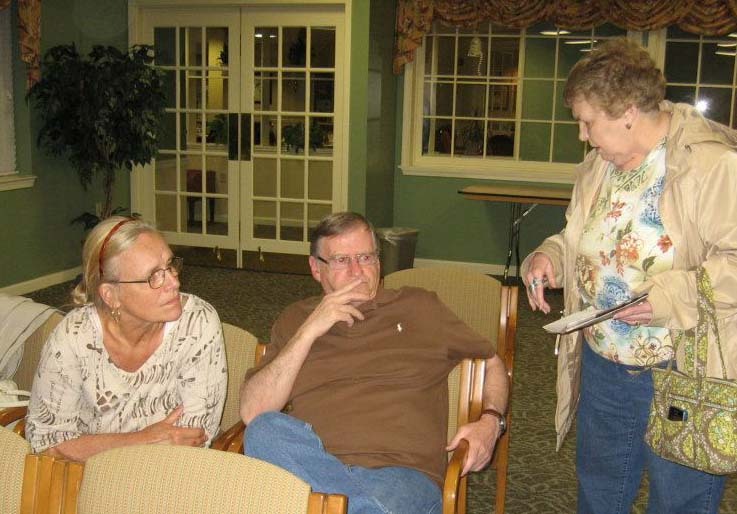 A Genealogical Society member discusses genealogy with Friends Village residents. 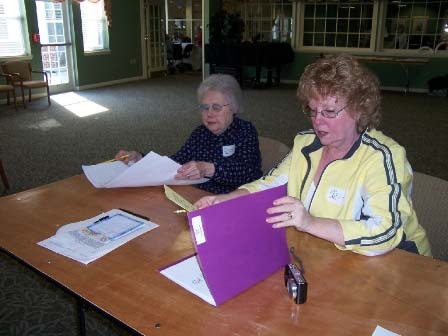 Emma Scholes from the Genealogical Society assists a participant with her papers. President Bonny Beth Elwell presents some helpful hints for beginning genealogists.